This is part 2 in a series of articles that can lead to a leaner and meaner wiki for Fedora Project. Part 1 was on "what needs to be done and why". Look at the menus on the left at the "Toolbox" near the bottom. Lets begin in the second section which is titled "List of pages"
* All pages - allows you list all pages beginning with a specific string. It defaults to the main space but can also be used to find pages in other namespaces. Example: Looking at pages that begin with "bug" shows all the BugZappers/Meetings/* files that can be moved to the Meeting namespace. The directory hierarchy style of naming in a carry over from the old wiki system and is not recommended in the current mediawiki environment. So these files should also be renamed to something more like "Bugzappers meeting minutes $date" and placed into a category such as "Bugzappers meetings". Another large example would be pages that start with Extras. Since Extras is from Fedora Core days, I would guess that many of these pages can be archived or renamed. Warning: All pages will list redirect pages as well as pages with content. For example, listing all pages that start with Docs/Beats also shows many pages. However, follow one of the links and you will find that these pages have already been renamed to Documentation Beats. [Look below the (new) title and above the banner image where is says "redirected from" - the URL will not change (yet)]. This is an example of why it is more useful for members of a team to move their own pages rather than the wiki team trying to keep track of everything. *Categories - lists all the categories that have pages. Use this list to find an existing category or to get ideas for additional categories. There are less than 500 categories at the moment. Example: There was already a "Board meetings logs" category and now there is also a "Board meetings" category. Docs Project has categories "Docs Project meetings" and Docs Project meeting logs" and "Docs Project archives" and several others. Tip: Categories can be placed in other categories. This provides the hierarchy. The above mentioned Docs Project categories are all sub categories to "Docs Project"
Warning: Category names are case sensitive and spelling does count. * Uncategorized pages - pages that are not yet in any category. The wiki team would like to see this page have "no results" Currently there are about 3700 pages here - or more than one third of the "content pages" in the wiki. Since Paul has begun cleaning up the Board pages, BugZappers is the next good example alphabetically. * Uncategorized categories - categories not yet in other categories. The wiki team would like to see this list trimmed to less than a dozen. 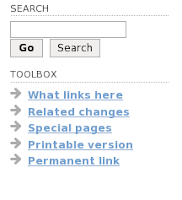 Now that you have found the pages, the next step is to rename them and add categories. For renaming see Ian's tip of the week entry. For categories return to my notes on wiki cleanup and its links to policy and help pages. Next time: more examples of using categories. One thing you can do is sub categories. If you do it by year, there would be 3 categories (2006, 2007, 2008) at the top and the current year at the bottom. If you are really adventurous you can divide them by Release instead. computers and basketball - you know I really love you if I read these posts, because I really don't understand most of them. Sigh.